Good showrooms can give people ideas and the stimulus to begin that project they have been dreaming about. Unfortunately they can also cost a lot! Our challenge as a fledgling business was to come up with an appealing yet economical display of all our timbers to show off their full potential and tempt our customers into trying different woods. Fortunately, the wonderful thing about a small mill town is the amazing attitude and array of skills of most of the workers. Nothing fazes them – heights, plumbing, electrical work, laying carpets, servicing fork trucks. You name it – they can do it. 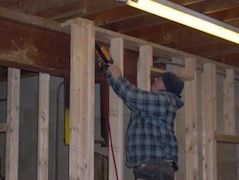 In this instance, Bill and John did a great job framing and insulating, electrifying and plumbing, but they worked in the middle of winter in horrific minus 20 degrees conditions (see pictures)—thanks guys! After all that hard work, baseboard heaters now take the chill out of the air in the showroom and bathroom, although winter customers are reminded that we are not heated in our warehouse so remember to bring your winter woolies. Our showroom is now in great shape and we get regularly complimented on how useful the displays are. This is because we display each type of timber we stock with one half finished, making it easy to visualize how the woods will look in a completed project. We also have our first piece of studio furniture on display. Flemming Christiansen from Denmark has made a superb cabinet in white oak on a Burmese teak base with (can you believe it?) a finish of soap. He did this while completing his studio fellowship at the Center for Furniture Craftsmanship. With quarter cut oak in the drawer sides, precision hand cut dovetails and 200 hours of patience gone into producing it, one can only admire the fine craftsmanship. If anyone would like to display topical furniture let us know – maybe we can supply wood for 3 items – one for you, one to sell (and share the proceeds) and one for our showroom?